Baker Love Lawyers is the oldest law firm in Newcastle and the Hunter. William Henry Baker founded the firm W.H Baker Solicitor in 1875. W.H Baker was the son of a respected Hunter Valley lawyer, Henry Baker, who first set up a law practice in Newcastle in 1841 before subsequently becoming the Registrar of the District Court for the Hunter River District in 1861. W.H Baker’s practice flourished in Newcastle, with W.H Baker being the Newcastle City Council’s Solicitor until his death in 1931. While always maintaining the name, Baker, the practice had traded under the name W.H Baker Chippendale, W.H. Baker McKenzie and Baker Cohen. W.H Baker established not only the Newcastle practice, but records also show him practicing in Wallsend from the 1890’s. In the early 1900’s he also established a practice at Raymond Terrace. 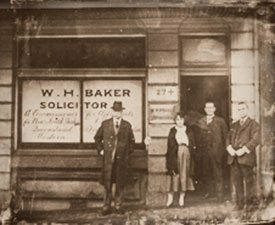 Following W.H Baker’s death in 1931 his practice was carried on by his son, Fred Baker, himself a respected Newcastle businessman and rural property owner who continued to run the practice during the war years of the 1940’s. Fred Baker formed a partnership with Mr John Milton Wallace Love, the firm then becoming known as W.H Baker Love. John Love had returned from military intelligence service during WWII, and the partnership continued through until the death of Fred Baker in 1959. Mr Love was joined by a young Articled Clerk in 1959 by the name of Donald McKinnon Geddes, later to become the Senior Partner of the practice and, he quickly built a reputation as an exceptional criminal lawyer. He was a very popular lawyer and character in Newcastle, devoted to his duties as well as client practice, and eventually becoming the Deputy Lord Mayor of Newcastle. Under his leadership the practice expanded from its original commercial base with offices in Newcastle and Wallsend to re-opening an office in Raymond Terrace and in 1978 opening an office in Charlestown. Through Don Geddes’ efforts, the practice grew significantly during the 1970’s and early 1980’s. Don Geddes left the firm on the 8 May 1981 to become a barrister practicing at the Newcastle Bar until his unfortunate and sad death on the 24 October 1992. In 1970 Don Geddes approached and engaged Hura Herman to join the practice. Hura commenced on the 7th of October 1970 working in the areas of divorce law and family law. Hura became one of the first Family Law Accredited Specialists in New South Wales in 1993. In 1971, Don Geddes articled Bruce Hurrell as his Clerk, working through the practice to become a partner in 1978 at the age of 25 years and then to become the managing partner of the practice. Bruce Hurrell says that the early years of his time with W.H Baker Love and Geddes were interesting and challenging times. The practice handled large commercial and criminal matters and worked closely with the very best of the NSW Barristers, such as Donald Stewart who later headed ICAC and became a Judge in the NSW Supreme Court and the late Major-General Basil Michael Hogan, ED, who became a Judge of the Family Court of Australia. The experience received working along side these capable lawyers was a wonderful opportunity. In 1984, with the expanding family law practice, Hura invited Jillian Stibbard to join the then partnership with Bruce Hurrell and other partners. Jillian joined and continued the excellent and professional reputation of the firm as a leading family law practice. Terry Morgan joined the practice in 1985. Terry had significant skills in banking and taxation areas and joined the partnership for a short time before himself leaving to join Robert Rutter, another respected Wallsend lawyer. Terry became managing partner of that practice and in 2006 his practice, Rutter Morgan, merged with Baker Love and Terry continues as partner to date with Bruce and Jillian. The merging of Terry’s practice significantly expanded the skills and resources of the practice. Changes were not always brought on by the partners’ own decisions. In 1989, the Newcastle earthquake saw the firm’s then 4 storey building on the corner of Church and Watt Street, Newcastle opposite the Police Station and Court House shattered by mother nature; however, the re-grouping and re-building and construction following the earthquake damage and the remarkable efforts of the staff and lawyers to keep services running to clients through that time were experiences which brought about strong bonds within the firm’s team. Baker Love also set up a small Singleton practice to service the growing clientele in that area for a period during the late 1990’s. Over the years the strength of the Wallsend practice saw the consolidation of other branch offices to within the Wallsend practice in 2008, which fortunately timed with the economic downturn caused by the global financial crisis. The coordination of the expanded office and the modern facilities with ongoing provision of additional facilities has provided a very harmonious and cooperative working environment for our skilled lawyers and support staff. The personal success of the firm’s partners outside the law has itself been a matter of pride for the firm. They have successfully achieved considerable experience with regard to rural land, hotel operation acquisition, leasing, residential subdivision developments and construction in the building industry, as well as investments, superannuation and commercial property involvement. The experience and knowledge gained in their personal dealings has added to the quality of the legal advice available to clients. The period since the early 2000’s has seen the process of modernization of the practice at a rapid rate with advancements and technology for the provision of better services to clients. In 2011, new young partner Dean Frith complimented the firm’s strengths with his own advanced skills. Baker Love remains as a strong and advancing legal practice proud of its service to the Newcastle and Hunter Valley environs, maintaining a great reputation in the history supporting today’s legal needs and services. The firm saw its own changes as servicing and adapting to the changing needs and environment to the Hunter Valley clients. Location change have always brought with it modernization and adaptability rather than the alternative of a staid and stagnant practice. Like any great legal firm, the history of Baker Love Lawyers will continue and as the years go by our staff will write their own new chapters in that history. But as time passes we are very conscious that for each of our members of staff they understand our long and rich past and become part of the philosophy of having a good reputation for outstanding legal work, strong ethics and that real depth of honesty required of a legal practice. We are proud to be the longest established law firm in Newcastle and want to continue to carry the tradition forward for many years to come. We are also proud of the many firms created by lawyers who have had their training and experience at Baker Love. Our members have in some instances gone on to become owners of strong legal firms with good reputations, others have gone on to become barristers and in the case of Justice Stewart Austin, a Judge of the Family Court of Australia. There have been so many good lawyers who have contributed to and have gained experience from the history of Baker Love. The benefits of that experience, knowledge and history is passed on to each of our trusted solicitors who themselves will be essential links for the future of Baker Love.